Here is an introduction to the world of specialty coffee. Watch this short feature video to learn more about the Coffee Trip web site. If you need some help in figuring out how to review a specialty coffee cafe, here are some guidelines that we find useful. There are two areas to a review – the review text and the rating. If you have an iPhone and have an interest in specialty coffee - either professionally or as an enthusiast – I think you will enjoy this app. And it’s free. Home Coffee Roasting has been completely revised throughout with new, up-to-date sections on the latest developments in home-roasting equipment and provides step-by-step guidelines to the coffee-roasting process. 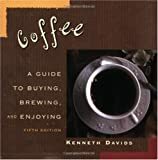 The new edition also features: A much expanded resources section for green beans and home-roasting equipment, the best techniques for storing green coffee beans, the new home roasters: how to evaluate and use them, tips on perfecting a roast, and information on how to create your own blend. This book contains easy, step-by-step instructions and recipes which enable you to roast coffee at home using household appliances. Includes instructions for a hot air popper method, stove top method, oven method, and for home roasting machines. Roasting coffee at home is easy and fun to do. Using high quality green beans you can quickly create a roast to surpass specialty coffee roasts.